A fantastic sea view, large infinity swimming pool and high quality spacious interiors - Villa Athina Sun is a great choice! Perched on a hillside surrounded by Mediterranean countryside, this villa is within walking distance of bars, shops and tavernas in Spartia, as well as a beautiful sandy beach. Pool heating, air conditioning/heating in the bedrooms and lounge and WiFi are all included. The stunning scenery from the poolside. 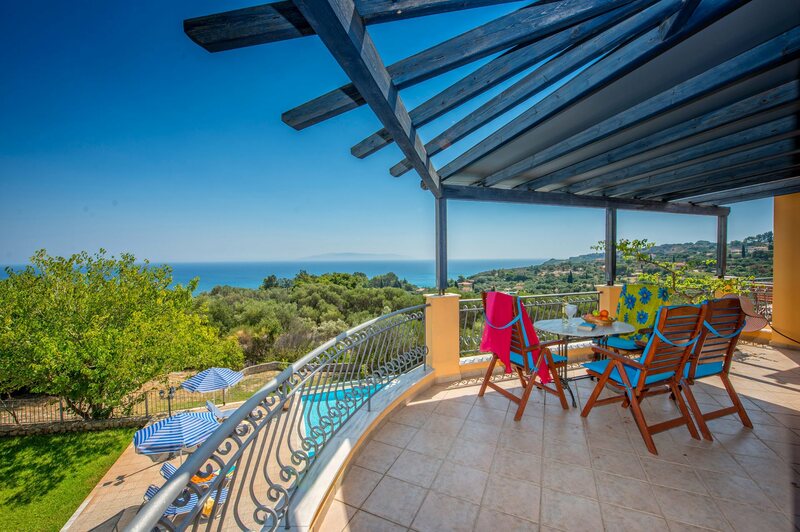 Villa Athina Sun is the perfect choice for a relaxing break in the sun! The villa is surrounded by a spacious, well-kept garden and has a large infinity pool where you can admire the views towards neighbouring Zante on the horizon. The terrace has a pool table and sun loungers dotted around - the perfect place for topping up your tan. Adjacent to the terrace is a lawn and brick BBQ. Why not cook up some tasty meals to enjoy in the shaded alfresco dining area, up a flight of 9 stairs, which overlooks the pool and fantastic sea views beyond. Entry to the villa is through large, wrought iron gates onto a private, tree lined driveway leading up to the front entrance. This continues round to the side of the villa to a large gravelled parking area. A covered porch leads to the front door and opens into lounge. There is a large lounge complete with a marble feature fireplace, sofas and TV. Patio doors open from the lounge onto the covered terrace meaning you can enjoy scenic sea views from inside the villa. The attractive terracotta floor tiles continue into the kitchen/dining area where a wooden dining table and chairs make an impressive central point. The fully fitted kitchen has a window over the double sink that looks out over the pool and across the olive groves to the Ionian Sea. The kitchen also has its own entrance door leading out onto the covered terrace and outdoor dining area . On the ground floor is the first of the four bedrooms with a wrought iron four poster bed, side tables and lamp. Patio doors from the double bedroom lead onto a small terrace with views onto the orchard below and across to the sea. There is a separate bathroom on the ground floor. An enclosed marble staircase leads upstairs to another double bedroom with a king size four poster brass and wrought iron bed. Patio doors lead onto a large, partly covered wraparound balcony with panoramic views up to Mount Aenos and across the Ionian Sea to Zante. There are also 2 twin bedrooms with private balconies on the first floor. All the bedrooms have en suite bathrooms and fitted wardrobes. This villa is registered and licenced by EOT Greek licensing association. This number is: 0830K10000837401. This private and stylish villa is set in an elevated position on the edge of the quiet village of Spartia and is only a short drive to the local beach, tavernas, and mini-market with the capital of Argostoli only 20 minutes away. There are a few tavernas within Spartia Village or head into Lourdas, 20 minutes' drive away, and dine in the main square in one of the traditional tavernas. Further afield, follow the coast for 40 minutes' by car to Katelios where you can enjoy fresh fish from one of the restaurants overlooking the sea. Within Spartia there is a village shop and mini market, perfect for topping up on holiday amenities. The nearby capital of Argostoli is definitely worth a visit with a greater choice of traditional and contemporary shops to explore, as well as a number of bakeries and tavernas. In Argostoli harbour you can buy fresh fish from the local fishing boats which bring their catch into the harbour every morning, closely followed by large Loggerhead turtles looking for scraps. The nearest beach is Spartia Beach, a steep 15 minute walk down the bay with an expanse of fine sand, very popular with the locals and a parking bay behind. To the left of the beach is a small jetty and harbour where local fishermen moor their boats and large turtles can often be seen swimming in the bay. The neighbouring resorts of Lourdas and Livathos are also within easy reach by car and have a choice of fantastic sandy beaches to explore. Lourdas offers boat hire as well as water and jet ski facilities in the summer for those who want more excitement . Alternatively, hire a boat and discover more secluded bays along this pristine coastline. For something more cultural, the beautiful Monastery of St. Gerasimos - the Patron Saint of the island - is half an hours' drive away. Why not visit Mounda Bay, the nesting ground for the Caretta Caretta turtles? The popular resort of Skala is 40 minutes' drive away with plenty of waterfront restaurants and a beautiful beach. Driving across the mountains to Sami on the east coast is a must for the spectacular scenery, as is a visit to the natural phenomenon that is Melisanni, the lake in the cave. Or visit Mount Ainos, although not for the faint hearted, which provides dramatic views of the unspoilt beauty of Kefalonia. Villa Athina Sun is not available to book for season as it is sold out. Take a look here at the Kefalonia villas that are currently on sale. Beautiful villa in an lovely spot. Well supplied and maintained. We loved Kefalonia, Spartia and the Villa Athina so thank you for a lovely holiday! Villa is exactly as described, lovely quiet and very comfortable, very picturesque.